Thinking of a Career as a Beauty Therapist? If you’d like to work as a Beauty Therapist providing therapy treatments in a beauty salon, here is everything you wanted to know about this exciting profession. Beauty services are a great place for the self-starting business entrepreneur to make their mark for their clients and with the right study and training behind you – you can be a success in any one of many exciting areas of beauty therapy. The graph shows historical and projected (to 2023) employment levels (thousands) for this occupation. Source: *Job Outlook Government website. ABS Labour Force Survey, Department of Employment trend data projections to 2023. 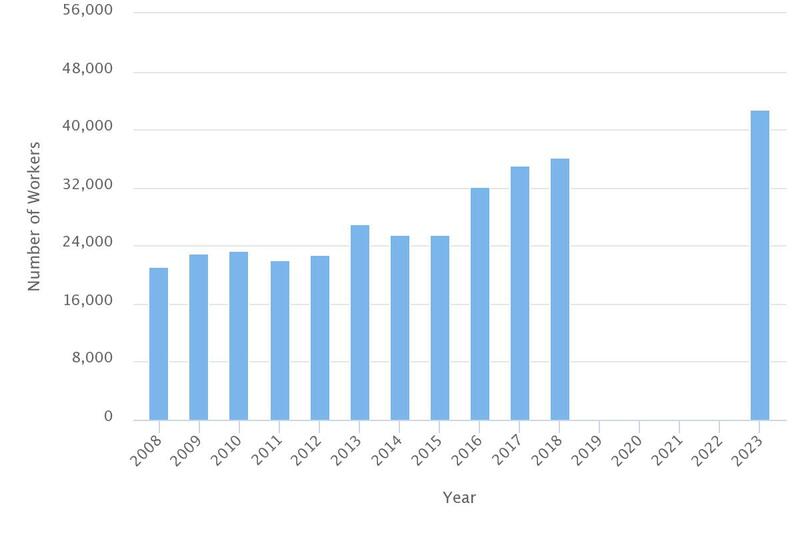 Over the next few years to 2023, the number of Beauty Therapist jobs (openings) for Beauty Therapists is expected to be 42,800. Job openings include employment growth as well as turnover. This is defined as people leaving their occupation for other employment or leaving the workforce. Employment for this occupation rose strongly in the past five years and also rose strongly in the last ten years. Looking forward, employment for Beauty Therapists to 2023 is expected to grow very strongly. Beauty Therapy careers are on the rise! Source: *Job Outlook Government website. 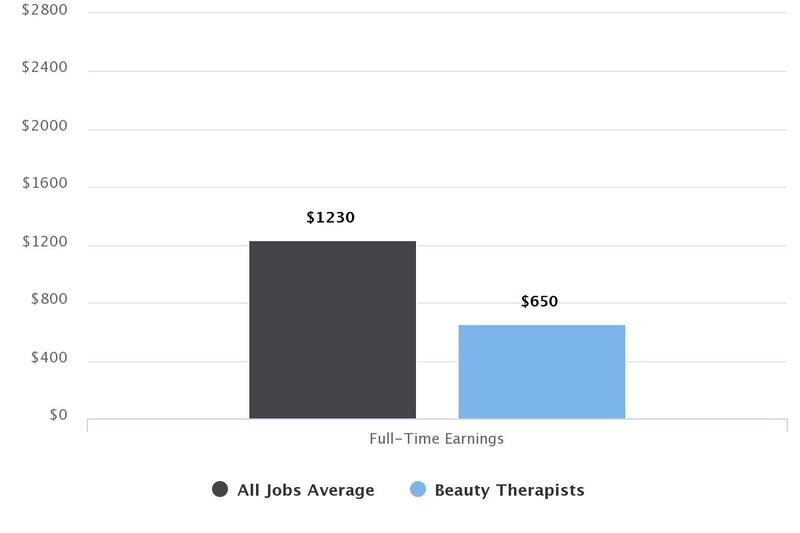 Beauty Therapists in Australia earn an average of $650 per week at full-time hours. Earning grow with more experience in the industry. The average pay for this occupation is around $33,800 per year. A Beauty Therapist salary varies depending on where you are located, and your level of current job experience. These figures are a guide only, based on the information from Job Outlook. Full-time or Part-Time Beauty Therapist? Jobs in Beauty Therapy may be full-time, part-time or casual. Most people work part time in this industry (44.7% fewer than all jobs average of 68.4%),showing there are many opportunities to work part time. Beauty Services can also be supplied as contracted work. This is a generally flexible career path, with many options for different working hours including 9-5, weekends, evenings and out-of-hours work. Source: *Job Outlook Government website ABS Labour Force Survey, annual average. Beauty Therapy Age Profile: How Old is the Average Beauty Professional? The data above shows the share of employment in percentage by age profile, when compared against all other occupations. 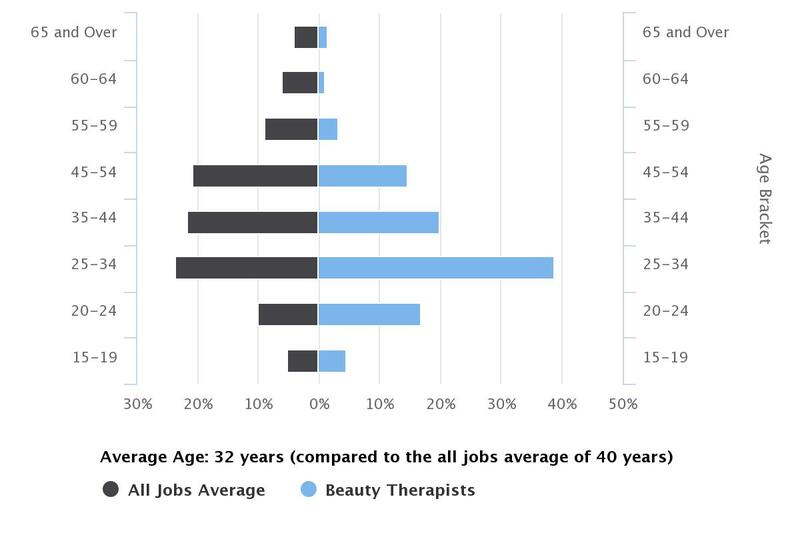 Beauty Therapists are well represented in each age category, with highest representation in the 25-34 age bracket, with around 38.9% of workers in this age group. 3.1% of Beauty Technicians are older than 55 while 4.4% are younger than age 19. 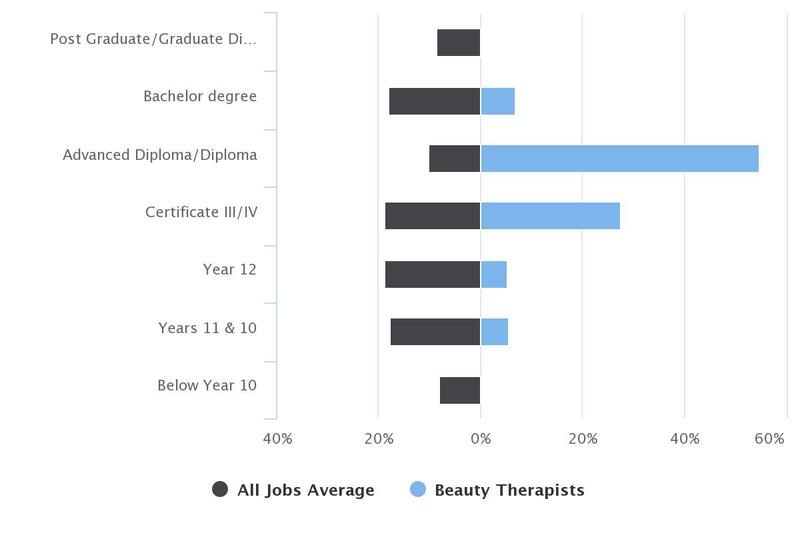 Available data for Beauty Therapy shows that the highest educational attainment achieved by most people working in this profession as being an Advanced Diploma or Diploma, with 54.7% of the total. 27.6% of Beauty Therapy workers held a Certificate III or Certificate IV. Beauty Therapy Courses: What Beauty Qualification Do You Need? Set yourself apart from the pack by becoming a trusted expert with a thorough knowledge of beauty techniques. As a student of this course, you'll receive a professional beauty kit, as you perfect your professional beauty therapy skills. Learn to perform the full range of beauty therapies ranging from facials, manicures, pedicures, and waxing, to spa experiences like Indian head massage, and more in-demand, advanced treatments like microdermabrasion. An ideal entry into the world of beauty, this is a comprehensive course that will give you a firm grounding in the principals of Beauty Therapy, so you can speak and act with authority on both treatments and products. This hands-on course gets you job-ready so that when you finish, you can walk straight into a job as a Beauty Therapist. With Certificate III in Nail Technology you will learn the very latest state-of-the-art techniques from Beauty Therapy industry professionals, so you can offer your clients the high-quality services that will mark you as an in-demand Nail Technician. As a student of this course, you'll also receive a free, professional nail kit to use, while you perfect your practical skills. Learn to perform high-quality professional manicure and pedicure treatments and design and craft beautiful, fun and trendy nail art for discerning clients. Why Study Beauty through Open Colleges? Our Beauty Therapy courses are delivered online, giving you the flexibility of organising your study around your life. You can enrol any time of the year and study at your own pace. Among other things, you'll learn how to work effectively in a retail environment and participate in environmentally sustainable work practices as you provide services to your clients. You’ll also learn skills such as how to advise on beauty services, design and apply make-up or nail polishes (as you elect) and how to build relationships with customers. Your course includes comprehensive student support to help you throughout your study. Once you've completed your course, you'll graduate with a government-accredited, nationally recognised qualification that will boost your chances of employment. Discover more about this profession with this infographic Your Career in the Beauty Industry. As a ‘spa’ therapist my role is a blend of beauty and massage therapy. Originally training in diplomas of remedial massage, reflexology, aromatherapy and Chinese medicine, this means that I can offer my clients a more holistic approach to their well being as well as keeping every day a mixture of treatments which helps my body (and mind!) cope with the demands of the role. As a business owner – other than the usual day to day operational running, my role is to ensure that my industry is well presented at sanctum with a high level of client experience and that our treatments and services remain results driven at all times. I also oversee all aspects of Sanctum as a business and a brand. Overall a day starts out with planning for the day ahead – looking at what treatments are booked in and making sure you have the products and equipment needed for each client. Once the treatment room is ready then it’s onto welcoming each client to the centre and performing any treatments booked in to the beauty salon. In between clients there are client notes to write up, stock lines to order and display, telephone and email enquiries to respond to and of course, plenty of cleaning to be done! What are the best parts of the job as a Beauty Therapist? The clients by far! If you are doing your job right, then you are building relationships with each of your clients and you become part of their lives. You hear all about the good times and the bad, new jobs, old jobs, birthdays, marriages and babies on the way. There are always new treatments for products to learn about and our view is that you should never stop learning regardless of how long you have been working. What skills/attributes do potential beauty services employees need to have? As a Beauty Technician, technical skills are a given – we recommend to get the highest qualification, such as a diploma, whenever possible. Not only does it mean that the Therapist should have a more in-depth knowledge of a wider ranges of skills, but it can also mean the difference in gaining employment. A good Therapist will be knowledgeable in the technical skills needed to perform their role – but a great Therapist will also hone their people skills. We believe that someone will book in for a service but rebook for the Therapist. Jobs in Beauty Therapy are always interesting. What are your favourite things about working in the beauty industry? Getting to play with some amazing products and the latest treatments is definitely a plus! Meeting new people every day and welcoming back regular clients who have allowed you to become a part of their life. Constantly learning and growing both as a beauty technician and a business owner. Thanks, Annie, for sharing your story with Open Colleges. Ready to take the next step towards your career in Beauty Therapy? Working in Beauty, you'll find the ability to connect with your customers, start your own flexible small business or work for many different types of salons. Fill in your details below to receive a course guide and a consultation with an Enrolment Consultant. If you’ve been wanting to change careers, gain a promotion, start a small business or begin an exciting new career in the beauty industry.